Color plays a central role in our lives. We are often not aware on how deeply we are influenced by colors we live in and with. We chose the clothes we wear, the colors on the walls of our homes and the food we eat - the colors on our plates. We resonate to the frequencies of colors. Advertisement uses colors, to sell us goods, we don't need. Why are we attracted to certain colors? Because our body and mind resonate to colors. Colors evoke certain feelings. Some colors are more yin, and others yang. And each chakra in our body swirls at a frequency related to a certain color. Balance is our natural state, so it is very natural, that we would be attracted to one color more than another, if this will bring us balance. We don't even have to think about it. A journey through our 7 chakras is essentially an expedition through the rainbow. Each of our seven chakras has a corresponding color that follows the colors of the rainbow: red, orange, yellow, green, blue, indigo, and violet (or white). The color of a chakra indicates our current physical, emotional, and spiritual state. When the chakras are balanced, energy flows into and out of each of these 7 centers harmoniously. Darkness disappears were there is light. We are light - and we can use light and colors for healing. Using chakra colors together with Chakra Sound, may help balance all areas of our life. 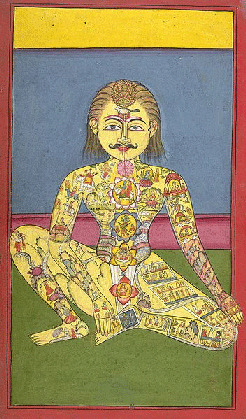 There are different techniques in using color for chakra balancing. My preferred technique is to use my imagination - my intent. When I feel the need to strengthen a certain chakra, I will meditate on that specific color. It will surround me; I will bathe in it; I will imagine breathing it in, towards the chakra itself. Don't take my word for it. Test it! It is related to the first chakra, the Root Chakra. Add red to your surroundings, when you feel drained of energy. The color red provides power from the earth. It connects us to our physical body. Survival, Vitality, Reality, Grounding, Security, Support, Stability, Sexuality, Individuality, Courage, Impulsiveness. Orange is related to the second Chakra... it is a very powerful color... a sensual, sexual color. Use sparingly... but enough for that special feeling of confidence and freedom. Feelings, Emotions, Intimacy, Procreation, Polarity, Sensuality, Confidence, Sociability, Freedom, Movement, Sexuality. Yellow is a bright color. It's like the sunshine! The third Chakra. It will charge you - let you see things with more clarity. It is great in small quantities. Too much could lead to anger. Personal Power, Will, Knowledge, Wit, Laughter, Mental Clarity, Humor, Optimism, Self-Control, Curiosity, Awareness, Self-Esteem. Green is the color of renewal and healing. It is midway in the color spectrum, between heaven and earth - the Heart - the fourth Chakra. It is soothing and promotes balance. Relationships, Love, Acceptance, Self Control, Compassion, Forgiveness, Harmony, Peace, Renewal, Growth, Self Love. Blue - Cooling Color of the Fifth Chakra or Throat Chakra. Rational thinking - non-emotional balanced state. Use this color when confronted with emotional upsets or when in need of extra caution and wisdom. Communication, Wisdom, Speech, Trust, Creative Expression, Planning, Spatial, Organization, Caution. Indigo Blue - the cool deep color - deep thoughts at intuitive level - clear as crystal. Cold Yin and night. The color of the Brow or Third Eye Chakra, the sixth Chakra. Intuition, Invention, Psychic Abilities, Self Realization, Perception, Release, Understanding, Memory, Fearlessness. Violet - the color representing the seventh Chakra, the doorway to bliss, knowledge and conscious co-creating. It strengthens the Pineal gland. Use violet to balance and open the Crown Chakra and enter higher levels of consciousness. Theta healing uses this pathway. Knowing, Wisdom, Inspiration, Charisma, Awareness, Higher Self, Meditation, Visionary, Divine Connection.